Saturday night saw the BT Sport cameras the the Morningside Arena for Frank Warren’s second card of 2019. 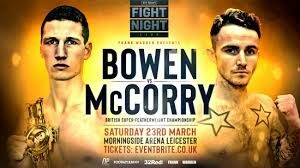 Headlined by Sam Bowen’s British title defence, against Jordan McCorry, the show saw entertainment across the card with Tommy Fury impressing on the unbroadcast undercard. Kyle Haywood and CJ Challenger fought nip-and-tuck for 10 rounds with the Midlands Area super welterweight title at stage and it was Challenger who shaved the scorecards, 97-95. The main event, though, saw Bowen looking to retain his super featherweight title at the first time of asking. Postponed and cancelled fights have blighted the 11 month reign of Bowen – Ronnie Clark withdrawing from scheduled defences in both October and February. Nonetheless it was McCorry, a two weight Scottish champion, who was in the opposite corner. The challenger started positively, planting his feet and trading in the pocket of Bowen. A left hand connected to an on-running Bowen, snapping the champion’s head back. The Scottish fighter was finding his target with surprising frequency, the torso of his 26 year old opponent was a regular landing spot for the punches of McCorry. Ibstock’s champion was by no means in uncomfortable territory and was digging in, himself, pushing shots and landing on the counter. McCorry fancied himself in the contest, even if most people didn’t, and was continuing to bring the fight to the champion. Aware he was fighting on away soil it was the Scotsman, who has suffered defeat on four previous occasions, who applied the pressure throughout the early stages but, in actuality, the success was being found by the local man. Bowen had been warned twice over the first couple rounds about shots to the back of the head, McCorry repeatedly leaned downwards to try and bait the point-deducting punch. Bullet won the vacant title last April with a comfortable victory over Maxi Hughes in which he displayed relentless aggression combined with shuffling footwork. He wasn’t really able to find that sort of an ebb and flow in this particular contest, thanks to McCorry’s come-forward nature, but he was still immensely successful with his shot selection. After an initial struggle in the first round everything seemed to stem towards the direction of the champion. Gradually the more polished work of Bowen was slowing his challenger down, suppressing the attempted aggression. Several crisp left hand seemingly kept McCorry acutely aware of the power possessed by his partner for this particular dance. An angry dance. The halfway stage saw, referee, Marcus McDonnell calling for McCorry to “stop moaning and get on with it”. Well, the champion certainly listened and set about beating up the body of his opponent in truly energy-sapping fashion, shellacking shots sending teeth into the crowd. A point was deducted from the challenger, continually dropping low, his muttered protests merely serving to annoy the third man in the ring. Bowen was on top in the sixth round, firmly, with chipping uppercuts catching the rope-a-dope McCorry on six, seven occasions. Remaining present in every round and finding burst of success this was by no means a merciless assault on McCorry but, certainly, Bowen was comfortably on top and winning the rounds. A frustrated challenger saw a second point deducted in the seventh, along with a stern warning to calm down and quit the protests. Bowen bloodied the nose of his opponent as the contest went on, wearing his man down and just picking off the rounds with relative ease. 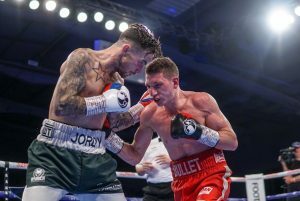 McCorry was landing shots that kept Bowen on his toes but the British champion was demonstrating why he’s ranked by the WBO. A mile in front in thanks to his gritty, hard work, it was a genuinely beautiful performance from Carl Greaves’ man. The ninth round saw McCorry wobbled, nearly touching down, before Bowen kept on clubbing away at the sapped, wilted body of his challenger. The referee came in, out of mercy, with the 28 year old absorbing punishment. A confident win for Sam Bowen who was made to work hard but emerged unscathed. Nathan Gorman faced a last-minute replacement in Kevin Johnson, original opponent Fabio Maldonado opting to take a bout, in what could serve as a good comparative exercise. Last year Daniel Dubois, Gorman’s heavyweight prospect rival, was extended to 10 rounds by Johnson in what was a thoroughly negative affair. The American, famed for fighting Vitali Klitschko some 10 years ago, was in an equally dour mood for his first fight (and probably last) fight in Leicester. Standing with his hands tucked, at shoulder height, close to the chin and with his chin grazing the shoulder of Gorman, there was very little in way of optimism. Gorman, trained by Ricky Hatton, was cruising his way through the contest – his sixteenth as a professional – and, to his credit, looked to land a variety of punches. Johnson’s sole punch of choice was the jab and he speared that in towards the younger man. The fifth prospect – four unbeaten – in seven fights for the American was getting traditional “Kingpin” treatment. He never looked like he was trying to win as opposed to trying to make Gorman look bad. Hatton’s fighter, based out of Nantwich, was landing with fluidity. His best round came, perhaps, in the fourth round when Gorman landed with snapping, downwards shots through the guard of Johnson. The pattern was repetitive with Gorman continually getting the better of an opponent who lacked ambition. Distinctly involved in a no-win situation, Gorman was likely to always face a bit of stick but there’s very little you can do when faced with someone who just won’t budge, nor will they offer much to work off. Gorman, for his part, was looking to land with variety and aggression. He managed both but against someone who was always going to be a damp squib. 100-90 the scorecard from Ian John Lewis. Sam Maxwell entered the ring in a confident mood with expectations of an early stoppage over Sabri Sediri. It was his French opponent, five years younger at 25, who made the immediate impression with a left hook fired in over the first thirty seconds. Halfway through the first round and a well time lurching left hook caught Maxwell as he was about to throw a shot of his own and the 30 year old hit the canvas. Sediri came out swinging with intentions to finish the bout as quickly as possible, bulleting shots towards his opponent in a ferocious bid to force the stoppage. The second round saw the pace of the fight mellow slightly but Sediri’s hand speed continued to pose problems for the home fighter. Teeing up with a jab, falling short of the target, Sediri landed a perfectly timed over hand right straight down the gully of Maxwell and the Liverpudlian was down, again. 20-16 after two rounds, it simply could be no other way, and suddenly the pressure was very real. As the contest progressed the more immediate threat towards Maxwell – namely the left hand of Sediri – began to get stifled by Maxwell’s return to basics. Attempting to regain control of the contest and fight at distance, Maxwell sought to keep the jab popping rhythmically. Sediri found a groove of his own as he looked to land punches each time Maxwell looked to land in combinations. Maxwell, trained by Danny Vaughan, had notched up a record of 10 and 0 prior to this fight and was beginning to garner a far bit of attention. His blistering punch power has seen eight previous opponents fail to hear the final bell but this was a more measured approach. Clearly wary of Sediri’s erratic approach to the fight, Maxwell continued to simply box better. The jab was thrown from a good distance and he began to double up with punches through the guard as we hit the halfway mark – his confidence clearly increasing as he picked up the rounds. Cries of “allez, allez” came from the Frenchman and his corner as he gesticulated passionately towards his chin, attempting to draw Maxwell into the danger zone. The 30 year old stuck to the plan of picking up the rounds through a better, more consistent work round. Sediri caught his man, by far the toughest of his career, with a powerful three shot combination, in the seventh, that rocked Maxwell and nearly saw him touchdown. The momentum of that seventh round barrage flowed into the eight round, of a scheduled ten, with Sediri openly trying to dispatch the pre-fight favourite. Hugh shots came raining in on Maxwell in what was, best described as, an attempted decapitation. The former GB Lionhearts representative was eating punches, clean. The final round came about of a dramatic fight with Sediri leading on momentum and, arguably, the scorecards. Maxwell’s face visibly battered from the onslaught of his, previously, unknown French opponent. With 60 seconds to go it really was up in the air as to who the winner would be and Sediri looked to take it out of question. A left hand saw the legs of Maxwell wobble, drunkenly, Sediri mocked the reaction of his counterpart. Confidence, arrogance, call it what you will but Sediri was visibly having fun until, that is, with 15 seconds to go, Maxwell unfurled a shot of the highest quality. The only real shot of menace from Maxwell in the whole contest but a superfluous a right hand right on the chin of the French fighter. He stiffened, then stumbled, but the contest was over right at the death. Sam Maxwell, god knows how, with a ruthless knockout to claim the vacant WBO European Super Lightweight title but, boy, he had it tough.